When it comes to starting a blog on WordPress, I’m sure you’ve heard enough overwhelming information on the web for one lifetime. If you’re looking for practical steps that you can use today, then you’ll love this post. It’s a step-by-step that will help you to get started with blogging today, even if you are a beginner. I’ll ALSO show you how to connect your domain name to your new WordPress blog. Here are the steps you’ll learn to get started with your blog. I’ll be walking you through each step and promise to keep it as clear as possible. You’ve probably asked yourself these questions and today, you’ll have the answers! 2. How can I choose the best domain name? 3. Which blogging platform should I use? 4. What is the best self-hosted blog provider? 6. How to install and use a WordPress theme for my blog? There are WAY too many people starting WordPress blogs every moment of the day that think their topic will be interesting to EVERYONE! If only it were that easy, we’d ALL be Internet millionaires. If you are serious about starting a blog that has the potential for real success, you need to have a better plan. YOU want to be the one that has the content everyone in your target audience is attracted to. In this section, I’m going to help you learn about two techniques that almost guarantee that you will get traffic to every piece of blog content you publish. If you want to make money, it’s your crucial first step to getting started with blogging. Getting started with blogging required that you know exactly who you are writing content for. That in itself will make it easier to decide what to write about. For example, if your niche market is “new moms who are busy and want to get in shape,” then your blog posts won’t appeal to someone who is not a mom and could care less about being fit. Using our example, you can find tons of topics to write that would address the problems, needs, and wants that a new mom faces when they are trying to get in shape. If you create valuable content that fills the need of your audience, BAM, you have a winner! Your blog content strategy should then be focused on creating content aimed at your niche market only. Conversely, if you wrote whatever you feel like writing in your blog, whose needs and wants are you fulfilling? If you want people to be interested in your blog content then write content that interests them. Trying to think up all the things that your audience might be interested in is like looking for a needle in a haystack. What CAN you do to create blog content that gets people interested? To attract readers, you should understand what your audience is searching for online. This will help you understand the needs of your audience. Once you do, coming up with blog topics to write about will be easy peasy. Now that you know what your blog is about, you can focus on choosing a domain name. A domain name is the URL that will identify your website. So, what domain name should you choose for your new blog? It’s not an easy question to answer since it’s a personal preference for each person but it sure is fun to find one. You probably already have a few great ideas that align with your blog topic. There are over 400 domain extensions. I’ll just give you the low down on a few to help you make the best decision. .com (commercial) – Originally intended for commercial websites, it’s become the most popular domain extension on the Internet. It can be used by anyone. I highly recommend using this one. .net (network) – It was originally intended for networked websites and technology companies. The .net extension is commonly used if the domain name you want is not available in .com. .org (organization) – Originally intended for non-profit organizations. If you are not a non-profit organization, don’t use it. .info (information) – If you are planning to monetize, the .info domain is not ideal. It’s perfect for an information only site. Don’t pick this one. .biz (business) – Created as an alternative to .com, this business domain extension is intended for businesses. .me (personal) – If you have a personal blog with no commercial intent then this is the domain extension for you! Resist the use of hyphens and numbers in your domain name. When thinking up a domain name, you may get a thought about using hyphens or numbers. Fast-Fresh.com – People have to remember the dash and where it goes. Is this memorable? NO. FastFresh.com – Flows nicely and is memorable. See the difference? Which one do you like best? Fresh4You.com – May sound nice but try telling it to someone! Now tell people your domain name. Fast dash fresh dot com. Fresh the number four you dot com. Keep your domain name simple. You are probably wondering if you need to purchase your domain name at the same company where you decide to host your website. Purchase your domain name at any domain registration company. Purchase your domain name while setting up your webhosting. Check out NameCheap now to grab your domain name. Note: Only register your domain name here. After you set up your blog, you’ll point your domain name to your new blog. So far, you know what to blog about and purchased a domain name! AWESOME! Let’s move on to choosing a blogging platform. Choosing the system to build your blog is a crucial step since you’ll be using it for a long time. As you can see in the image, there are many blogging platforms to choose from. With over 82 million users, WordPress is the most popular blogging platform out there. And for good reason. Thousands of design themes to choose from. Tons of support – easy to find answers to your questions. Simple to learn – lots of tutorials available. Your audience can easily engage with and share your blog content. I’m sure there are more reasons why WordPress is the best blogging platform, but these are the highlights. Here’s a more in-depth article about why using a self-hosted blog may be the best solution for you. WordPress.com is a free blogging platform. There are policies that you must abide by, which don’t give you the freedom to do whatever you want with your blog. These policies also have restrictions on monetization methods. So, if you are building a blogging business, it might not be the best option for you. The FREE version of WordPress is geared towards people who are not serious and just want to blog as a hobby. WordPress.org is a self-hosted blogging platform. This means that you need to “rent” web space from a web hosting provider. (Don’t worry, it’s very simple – everything is automated these days). You have the freedom to do whatever you like with your blog and use any monetization method. The self-hosted version of WordPress is geared towards people who are serious about building a blog that has the potential to make money. I highly recommend that you start your blog with self-hosted WordPress. Understanding how to start a WordPress blog begins with hosting. In this section you’ll learn about how to start a self hosted blog. Many website owners will direct you to and recommend web hosts that they don’t even use for their own blogs! They get a high commission through affiliate links. What CAN you do to find the best WordPress webhost? Get proof that the person recommending it actually uses it. As a long time blogger, since 2009, I have used many web hosting providers over the years for WordPress. I’ve had to migrate my websites from one host to another more than twice. I’m not here to badmouth any web hosts but I will make a recommendation based on my own awful experiences. The BEST self-hosted WordPress provider is SiteGround. I switched to them 4 months ago as of this writing and couldn’t be happier. The setup was easy, seriously. Customer support is extremely responsive. You can read my SiteGround review for more information. If you are transferring a site, read my review about my SiteGround transfer experience. Choosing where you want to host your WordPress blog is an important decision and I confident that you’ll love SiteGround as much as I do. That’s how you’ll get a HUGE discount. Most web hosts do not offer monthly recurring charges. Choose the plan that best fits your needs and click Get Started. I recommend the StartUp plan, which is perfect for a new blog. Should you need to upgrade later, you can. I did upgrade to the GoGeek plan and it was a smooth transition that SiteGround handled. – If you registered your domain at another company, choose I already have a domain. Enter the domain name. – If you did not register a domain name yet, click Register a new domain name and enter it. – If you are transferring your blog website from another web hosting provider, SiteGround will do the website transfer for you! – Purchase information. Remember, you are getting a 60% discount! Pretty cool! If you are registering a domain at the same time, DO select Privacy. That’s it! You’ll receive an email with your account information! I’m excited to be on this journey with you. Let’s move on to the next step: Installing WordPress [super easy]. Check your email from SiteGround to get your account information. Let’s go to something called cPanel and get WordPress installed with the autoinstaller. Click Go to your SiteGround cPanel. On the WordPress page, click Install Now. On the Software Setup page, select the Protocol, Domain, Directory and then fill in your Site Settings. Be sure to write down your admin username and password in a safe place so you don’t forget it! You’ll need it to log into WordPress. When finished, click Install. You will receive an email when the installation is complete. Did you register your domain name at a different company? No worries! In this section, I’ll show you how to easily POINT your domain name to your newly installed WordPress blog. If you registered your domain at SiteGround, skip this step. You’ll need the name servers for your new SiteGround hosting account. This is so you know where to point your domain. Go to the SiteGround cPanel. Look in the upper left to find the two name servers. You’ll need both. In this example, I am using NameCheap. If you registered your domain name at a different company, you can follow along but the exact procedure may differ. Log into the account where you registered your existing domain name. Under the Domain tab, in the NameServers section, select Custom DNS from the drop down list. Add the two nameservers in the field. It could take up to 48 hours for your domain to propagate through the Internet and point to your newly setup blog. But I usually see it finish within an hour or so. All that means is the time it takes for your DNS change to take effect! Now that you started a blog on WordPress, it’s time to install and activate a theme for your site. A WordPress Theme is what provides the graphical interface for your blog. 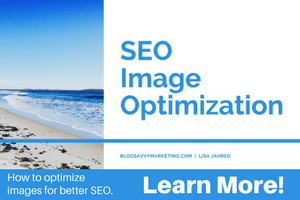 It sets the look and feel of your blog, as well as the navigation of your site. There are thousands of free WordPress themes to choose from or premium themes which you can purchase. Since you are just getting started, why not start with a free WordPress theme for your new blog? If you decide to go with a premium theme, I recommend StudioPress. I’ve used their themes for years. They are easy to customize and work with. Plus they have an amazing support community and tons of tutorials. Login to your WordPress Admin panel and go to Appearance > Themes. There are themes that came with your WordPress installation. They will all display here. If you want to add a new one, click Install Themes. When you find a theme you want to use on your new WordPress blog, click Install. After the theme is installed, click Activate. After you activate your new WordPress theme, go to the home page of your blog. Voila! Check out how it looks. Now you can start writing some awesome content and get blogging! Starting a self hosted blog using WordPress is an exciting start to your online business. You’ve read about the steps to how to make a blog for beginners. Now it’s time to implement them. Deciding what to blog about! Once you understand what your main topic is, learning how to start a blog using WordPress is that much easier. You’ll know exactly who you are writing content for. Plus you can attract more people to your blog. 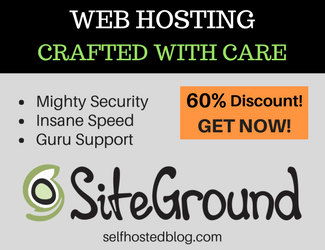 Start your self hosted WordPress blog with SiteGround now and get 60% discount!. You just nailed everything in one post.